Altitude Junkies’ expedition to Cholatse in autumn 2014! This 6440 meter high peak is located at Mount Everest National Park just across the valley from Ama Dablam. 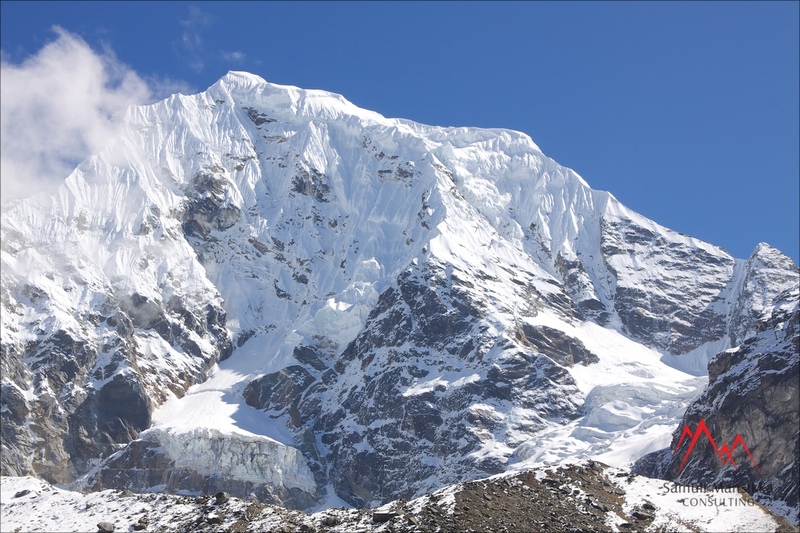 It is consider as one of the more difficult peaks in the area and has not been climbed often. We approached the mountain from it’s Gokyo-valley side and placed our basecamp at stunning setting at 4700 meters. Our whole team was successful in climbing the SW-ridge which proved a lot longer and more exposed than at first expected. We had exceptional weather conditions and stunning views over the region. Read Phil’s dispatches here! Captions for my pictures can be found at our Facebook page here! Altitude Junkies’ Cholatse team choppered to Namche today! I am to follow by flying to Lukla tomorrow! Landed in Lukla! What a jump to a different world it everytime feels like! Dreamlike – I don’t know if Lukla really even exists in this World! Aah, Namche! I often forget how amazing this trek is! Following Dudh-river, passing through beautiful gardens and surrounded by snowpeaks! Arrived in Machermo (4450m) to meet the members! Staff at Cholatse setting up our basecamp! Many new lodges since my visit here in 2009! And we have our entire crew at Cholatse Basecamp (4730m)! Got the camp going nice and comfortable! The only team on the peak! Good progress on Cholatse! Members did an acclimatizing walk to crampon pt (5200m). We got the route fixed to 5900m including the crux! Climbed to tag Camp 1 (5700m) with all members! One of best weather days I ever had in the Himalayas; surrounded by dozens of high peaks! At Camp 1 (5700m) on Cholatse’s SW-ridge and what a view we’ve got! One of clearest days ever had here! Cho Oyu and Kyachung Kang nearby! Camp 2 on Cholatse at 6200m which leaves us with fairly short summit-day tomorrow! One of the most beautiful ridges I’ve climbed! All Altitude Junkies members summit Cholatse (6440m)! What a wild climb! One of best weather-days I’ve ever had in the Himalayas! All Junkies’ members and staff are back and safe and sound at basecamp! What a brilliant climb! Also got Miikka as first Finn ever on top! Woke up at Cholatse basecamp, now enjoying ice-cold beer at Jatra in Thamel! Helicopters are a freaking awesome way to move around Nepal! !